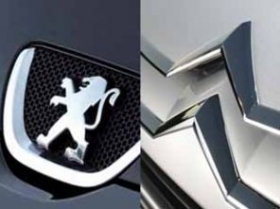 FRANKFURT - PSA/Peugeot-Citroen may close a production plant near Paris as part of company plans to defend profitability in the face of a possible European recession, CEO Philippe Varin said. PSA will eliminate jobs and intensify a three-year savings drive, Varin said. The carmaker may also close its Aulnay plant north of the French capital unless the competitiveness of its domestic operations improves, Varin said on Tuesday at the Frankfurt auto show. "There are no cost reductions without job cuts," the CEO said, declining to give precise details. "Europe is facing a period of weak growth or even recession." PSA is struggling to deliver on a pledge to narrow the profitability gap with Volkswagen AG by generating 3.7 billion euros ($5 billion) in additional earnings in 2010 to 2012, with the gain split between cost savings and improved sales. Cuts will now have to be increased to cover most of the target as auto demand and prices fall, Varin said. He reiterated the 2011 goal of an improvement on last year's 1.8 billion-euro operating profit. In June, PSA confirmed the authenticity of a leaked internal plan to scrap its Aulnay plant in 2014 and cut 3,600 workers, while maintaining that no decision had been made. The factory assembles the C3, the Citroen subcompact scheduled to be replaced in 2014. Executives concluded early in 2010 that no closure announcement was possible until after France's 2012 presidential election, according to the leaked document. "The future of Aulnay is guaranteed until 2014, but what happens after that is something we still have to work on," Varin said on Tuesday. "We have a problem with competitiveness in France, particularly in this vehicle category, and that problem has yet to be resolved."